NOTE: Bonus card offers do NOT apply to gift cards purchased online. Enter the required information on this page, and then click the “Buy Now” button. You will be re-directed to the Paypal website to complete your transaction. b.) Change order quantities, if necessary. c.) Choose your method of payment, CREDIT CARD OR Paypal account. Upon completion, you will receive an emailed payment receipt from Paypal – usually the same day. Please retain this email receipt as it contains your “proof of purchase”. NOTE: If you do not receive a payment receipt from Paypal, your transaction may not have completed. 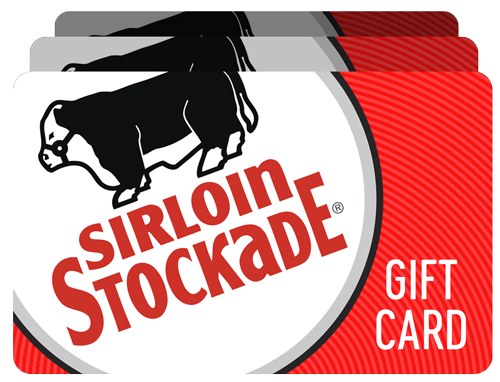 Sirloin Stockade is committed to protecting the security of your personal information. This transaction takes place over a secure connection. PLEASE NOTE: WE WILL USE THIS SHIPPING INFORMATION FOR YOUR GIFT CARD. IT IS NOT NECESSARY TO CHANGE IT IN PAYPAL. Standard shipping is $3.00 and your gift card should arrive in 5-9 business days. Expedited shipping is $10.00 and your gift card should arrive in 3-6 business days. Gift Cards can only be purchased in US currency, shipped within the US, and redeemed at participating US locations. You may not purchase more than $500 per credit card in a 30-day period. Orders will usually be shipped within two business days, not withstanding weather related delays, from Kansas. Orders will not be shipped out on Saturdays, Sundays, or holidays. There is no guarantee on timing of USPS deliveries. Once your order is completed , a shipment confirmation email will be sent to you by Stockade Companies. Some orders may require verification either verbally or through email correspondence. After contact has been made, this may result in delays of up to 1 business day before your order can be shipped. Orders of $200 or more must be shipped to the billing address. No refunds can be given for gift cards purchased on-line.